It was the first census not to ask for the name of the "head of household." Approximately 16 percent of households received a "long form" of the 1980 census, which contained over 100 questions. Full documentation on the 1980 census, including census forms and a procedural history, is available from the Integrated Public Use Microdata Series. Microdata from the 1980 census are freely available through the Integrated Public Use Microdata Series. Aggregate data for small areas, together with electronic boundary files, can be downloaded from the National Historical Geographic Information System. Personally identifiable information will be available in 2052. 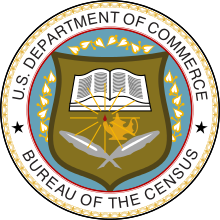 Between the 1980 census and the 1990 census, the United States' population increased by approximately 22,164,837 or 9.8%. ^ "Library Bibliography Bulletin 88, New York State Census Records, 1790–1925". New York State Library. October 1981. pp. 46 (p. 52 of PDF). Retrieved December 15, 2008.